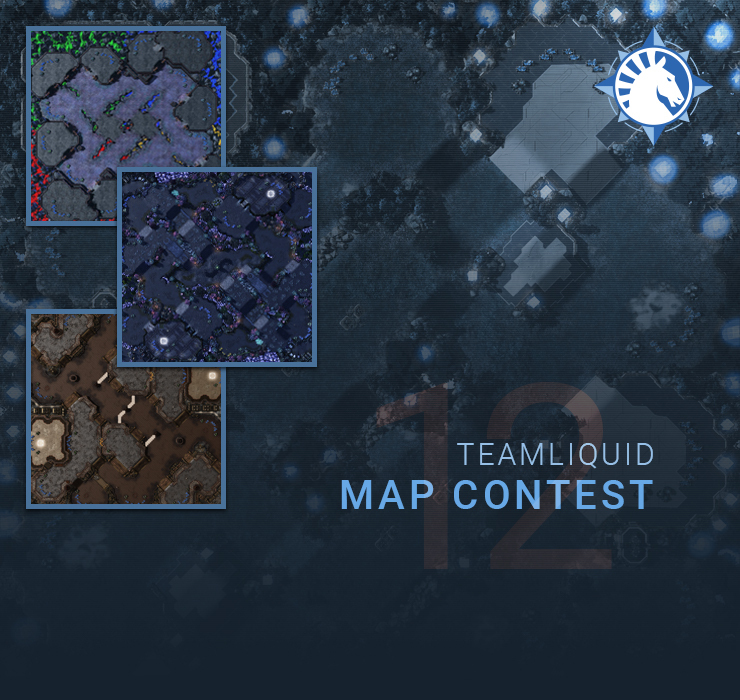 We've now received the last entry for the 12th edition of the Team Liquid Map Contest and it’s time to reveal some details about the traditional TLMC tournament. We've invited some of the best players around to play the top 16 maps from the competition, as chosen by our judges. And just as in the last three years, we’re happy to announce that Wardi will be arranging this tournament in cooperation with Blizzard. 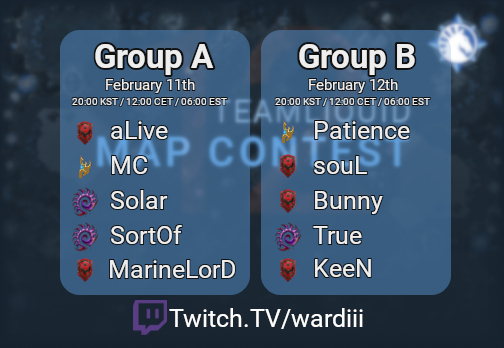 The tournament will commence shortly after the judging phase of the competition is complete, 11th to the 17th of February, and you can follow all the action on Wardi’s Twitch channel. The maps will be announced the weekend leading up to the tournament. For the player announcements, we want to do something special this time around. So over the next few days, we’ll announce a few players each day on our Twitter account until all 20 have been revealed. We’re well aware that not everyone uses Twitter, so don’t worry: we’ll also update this thread as the announcements are being made. However, we're happy to start off the announcement spree right away. The first two players willing to be our guinea pigs are no other than Rickard "SortOf" Bergman and Jang "MC" Min Chul. Both are storied players with long careers, and we're super excited to have them on board. Tiebreakers are: Match score, Map score and Head to Head. In case of a three-way tie, the last tie breaker is map score between the three players. First placed players advance directly to the Ro8, Second and Third placed players to the Ro12. Ro12 and Quarterfinals are Bo5. @Kantuva | Mapmaker | KTVMaps.wordpress.com | Check my profile to see my TL map threads, and you can search for KTV in the Custom Games section to play them. Time to apologise in advance to all the players that have to play on our terrible maps. The glory days are back with BossToss! A large amount of the pre-judging feedback revolved around avoiding cannon rushing spots (probably New Repugnancy PTSD), so the judges are doing their best to deny you your wish (Likely unsuccessfully. Pros would probably cheese on the new maps even if they were sixteen clones of Dusk Towers). i'm always down for a game of "find the new proxy oracle spot"
Killer. MC potentially playing on my map would be insane ! Grand finals also b09 ! The lineup is pretty strong this time. I just hope that someone will be there to translate the comments the pros have about the maps. Oh no, I didn't realize there was another TLMC going on and I missed it. Oh well, I hope the tournament is awesome! The lineup looks great. More updates TRUE, Hurricane, Impact, and aLive have also signed up! Edited in our last four contestants (Soul, marinelord, creator, and bly) and some info about the tournament! See you all Monday!